Keep your eyes and ears on Jesus, and keep your heart open to the Spirit of God. Ultimately, Lent is about a renewal of our relationship with God Most Holy through our Christian discipleship and living in Gods Spirit. Its about us allowing Jesus Christ to live out his obedience to God in our lives by drawing us into his ministry, dying, and rising. Remember the basic disciplines of prayer (listening), fasting (simplicity), and acts of charity (generosity). These can take on many different forms, but our spiritual practices will be fruitful if they are based on these principles. See if you can take part in these disciplines both as an individual and as a member of St. Roberts community. Remember RCIA catechumens and candidates in your prayer and community life during Lent. In our history, Lent developed specifically as a time for the Church to prepare with them for the celebrations of Baptism, Confirmation, and Eucharist. Come to Michael Reardons presentation of the The Gospel of Matthew this Friday (2/15) at 7pm in the church. Its free, but, aside from the sacramental life, it might end up being the most valuable spiritual gift youve given to yourself and your family in a while. Remember the old TV show, "Romper Room"? (Did it play out here in California?) At the end of each episode, the charming pre-school teacher would take up her magic mirror, look into its swirling face, and start calling out names of children in the TV audience, "I see Bobby and Rachel and Mike. I see Lolly and Warren. Oops, theres Theodore!" On and on the naming would go, and you would always hope to hear your own name called. You knew you were special if the teacher called you by name. FASTING symbolizes our hunger for God. The love that motivates our fasting comes to life in works of mercy and charity. Everyone aged 18 to 60 years is bound to fast on Ash Wednesday and Good Friday. The law of fast allows one full meal a day, but does not prohibit taking some food during the day, so long as it does not constitute another full meal. Drinking liquids during the day is permitted. When health or ability would be seriously affected, the law does not oblige. In the spirit of penance, the faithful should not lightly excuse themselves from this obligation. 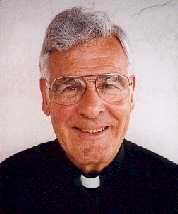 For Father Joseph Marini...We thank God for calling him to his priesthood and for these fifty years of loving service to his people...May he continue to be blessed all the days of his life. 6:30 am, 8:30 am, 10:30 am and at 6:00 pm. Do you feel called to attend Stations of the Corss? On February 15th, the first Friday of Lent, supper will be held in Hennessy Hall at 5:30 pm, followed by "The Gospel of Matthew" proclaimed by Michael Reardon, in our Church, at 7 pm. On Feburary 22nd, and March 1, 8, 15 and 22nd, Stations will take place at 6 pm, followed by a light Lenten supper in Hennessy Hall. We ask that you donate what you would have spent on your Friday dinner to our St. Vincent de Paul Society, that they may feed our hungry sisters and brothers. tomorrow night, Feb. 11th, in the hall, at 6:30pm. Those who kill by acts of terrorism actually despair of humanity, of life, of the future. In their view, everything is to be hated and destroyed. Terrorists hold that the truth in which they believe, or the suffering that they have undergone, is so absolute that their reaction in destroying even innocent lives is justified. Terrorism is often the outcome of that fanatic fundamentalism which springs from the conviction that ones own vision of the truth must be forced upon everyone else. Instead, even when the truth has been reachedand this can happen only in a limited and imperfect wayit can never be imposed. Respect for a persons conscience, where the image of God himself is reflected (cf. Gn. 1:26-27), means that we can only propose the truth to others, who are then responsible for accepting it. To try to impose on others by violent means what we consider to be the truth is an offense against God, whose image that person bears. For this reason, what is usually referred to as fundamentalism is an attitude radically opposed to belief in God. Terrorism exploits not just people, it exploits God: It ends by making him an idol to be used for ones own purposes. Consequently, no religious leader can condone terrorism, and much less preach it. It is a profanation of religion to declare oneself a terrorist in the name of God, the creator of man, who cares for man and loves him. It is altogether contrary to faith in Christ the Lord, who taught his disciples to pray: "Forgive us our debts, as we also have forgiven our debtors" (Mt. 6:12). Following the teaching and example of Jesus, Christians hold that to show mercy is to live out the truth of our lives: We can and must be merciful because mercy has been shown us by a God who is love (cf. 1 Jn. 4:7-12). The God who enters into history to redeem us, and through the dramatic events of Good Friday prepares the victory of Easter Sunday, is a God of mercy and forgiveness (cf. Ps. 103:3-4; 10-13). Thus Jesus told those who challenged his dining with sinners: "Go and learn what this means, I desire mercy and not sacrifice. For I came not to call the righteous, but sinners" (Mt. 9:13). The followers of Christ, baptized into his redeeming death and resurrection, must always be men and women of mercy and forgiveness. But what does forgiveness actually mean? And why should we forgive? A reflection on forgiveness cannot avoid these questions. Returning to what I wrote in my message for the 1997 World Day of Peace ("Offer Forgiveness and Receive Peace"), I would reaffirm that forgiveness inhabits peoples hearts before it becomes a social reality. Only to the degree that an ethics and a culture of forgiveness prevail can we hope for a "politics" of forgiveness, expressed in societys attitudes and laws, so that through them, justice takes on a more human character. Forgiveness is, above all, a personal choice, a decision of the heart to go against the natural instinct to pay back evil with evil. The measure of such a decision is the love of God, who draws us to himself in spite of our sin. It has its perfect exemplar in the forgiveness of Christ, who on the cross prayed, "Father, forgive them; for they know not what they do" (Lk. 23:34).